The Octavio Medellin Art Work and Papers digital collection is part of the Octavio Medellin Art Work and Papers physical collection, held by SMU's Bywaters Special Collections at the Hamon Arts Library. The digital collection mainly comprises Series 6: Negatives/Slides, which consists of approximately 4,500 35-mm slides taken by Octavio Medellin (1907-1999), ca. 1950s-1980s. The images are separated into categories documenting Medellin’s art career. 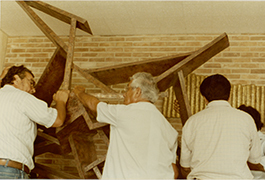 Included are slides of Medellin’s art work in progress and the processes he used in creating his sculpture primarily in stone, copper, and brass. Additional slides contain images of Medellin’s art installations in the Dallas area, including his mosaic work at Saint Bernard of Clairvaux Catholic Church, stain glass windows for the Trinity Lutheran Church, and glass ceiling lights in the Mercantile Bank Building. Other images are of his students and their work at the Medellin Art School, Medellin’s molten glass experiments, and his travels to Mexico where he studied both modern and historical architecture and relief carvings at ancient sites including Chichén Itzá, Palenque, and Tula. Several related items are also available in the digital collection, including Maya-Toltec Temples and Carvings, 1938, an album that contains 181 photographs of Medellin’s travels in 1938 in Mexico, his family, the ruins at Chichén Itzá, people associated with the ancient Mayan sites, and his art and travel friends David and Kayla Slivka, and Medellin’s portfolio of 11 block prints titled Xtol: Dance of the Ancient Mayan People; Murals from the Temple of the Tigers at Chichen Itza, Yucatan, Mexico, which was influenced by his 1938 trip and published by the Dallas Museum of Fine Arts in 1947. Octavio Medellin was born in San Luis Potosi, Mexico, in 1907 at a time when his country stood on the brink of a violent revolution. His family, of Otomi Indian heritage, moved to San Antonio, Texas in 1920 where the young Medellin began his art studies at the San Antonio Art Institute with José Arpa and Xavier Gonzales, Spanish artists who had relocated to San Antonio and established flourishing art careers. In 1928 Medellin left San Antonio and moved to Chicago where he studied at the Chicago Art Institute. A year later he returned to Mexico to begin a three-year study of his native country’s art, customs, and history – a period that proved to be a major influence in the young artist’s artistic evolution. He traveled throughout the Gulf Coast, including the Yucatan, and studied the local crafts produced in small villages and the ancient ruins and sculpture of the Mayan and Toltec Indians. Mexico’s unique artistic culture profoundly influenced Medellin’s art and that of the many students he taught over the next four decades. 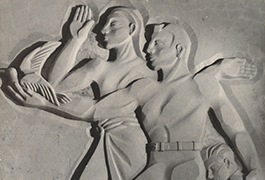 In 1931, Medellin moved back to San Antonio and taught sculpture at the Witte Museum and a few years later, with several other local artists, opened La Villita Art Gallery. There he met Lucy Maverick, herself a young artist whose family was influential in the historic preservation of San Antonio during the late 19th/early 20th century. 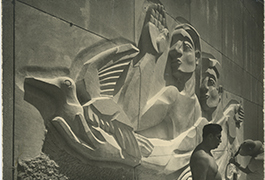 In 1938, interested in encouraging Medellin’s art development, Maverick sponsored the artist’s journey to Mexico for a six-month study of the ruins at Chichén Itzá and Uzmal. This trip is documented in the Maya-Toltec Temples and Carvings, 1938 photograph album. Medellin’s sketches of the sites were later worked into the portfolio of 11 block prints, Xtol: Dance of the Ancient Mayan People; Murals from the Temple of the Tigers at Chichen Itza, Yucatan, Mexico, published by the Dallas Museum of Fine Arts in 1947. Two of the original sketches are located in the Octavio Medellin Collection at SMU. Medellin continued to teach while finding time to do his own work. He taught at North Texas State Teachers College [now the University of North Texas], Southern Methodist University, and the Dallas Museum of Fine Arts School. 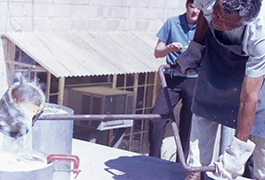 Throughout his career, Medellin explored other media including ceramics, mosaics, glass, lost-wax process in bronze casting – techniques he also taught to his students. 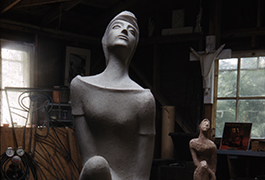 In 1966 he opened the Medellin School of Sculpture in Dallas and continued to teach until semi-retirement in 1979 when he and his wife, Consuelo, moved to Bandera, Texas. Medellin’s work has been represented in exhibitions and museums through the years including the Dallas Museum of [Fine] Arts, the Witte Museum in San Antonio, and the Museum of Modern Art in New York. In 1996, the Dallas Visual Arts Center, now the Dallas Contemporary, honored Medellin, along with Dallas artist Barney Delabano and art collector Raymond Nasher, with the prestigious Legends Award. Beginning in 1989, Medellin and his family began to donate his massive archival, art, and slide collection to Southern Methodist University. 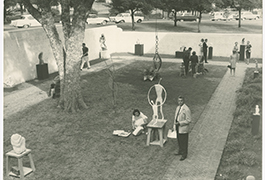 Now housed in Bywaters Special Collections, located in the Jake and Nancy Hamon Arts Library, the Octavio Medellin Collection consists of catalogues, clippings files, correspondence, fused glass experiments, photographs, slides, and works of art of paper that document his art career and his prominent role in the development of Texas art. Much of digital collection comprises Series 6, Sub-series 6: Flat Slide Boxes: 1950s - circa 1980s and is designed to mirror the physical collection. It is divided into Flat Slide Boxes, which contain multiple groups: Flat Slide Box 01, Flat Slide Box 02, Flat Slide Box 04, Flat Slide Box 06, Flat Slide Box 07, Flat Slide Box 08a-d, Flat Slide Box 09, Flat Slide Box 11. Below are links to images relating to specific pieces of art work, buildings, other art collections, people and events, and personal slides.